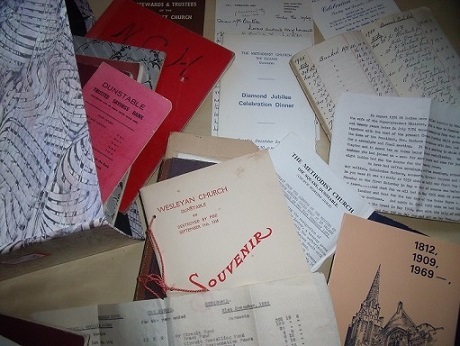 Methodists in Dunstable owe their origins to a local carpenter and joiner called John Darley. He had heard of the great John Wesley who was the founder of Methodism and on a visit to Nottingham in 1770 travelled to the nearby small market town of Bingham to hear Mr Wesley preach. In his journal Wesley was characteristically blunt about the occasion. Wesley preached a powerful sermon resulting in John Darley’s conversion and it is reported that Darley returned to Dunstable a changed man. It was Darley who in 1797, with others, applied to the Lord Bishop of Lincoln for a license to register the house of a Thomas Summerfield as a place of worship. In 1812 Darley opened his own workshop in Church Street, inviting people in to sing, pray and read the bible. 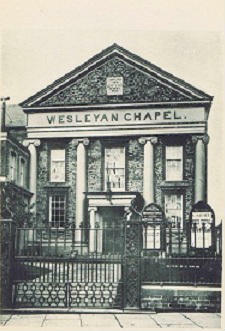 The first chapel built in 1831 was burned down in 1844 as the result of an incendiary attack on adjoining farm buildings. It was rebuilt in 1845. 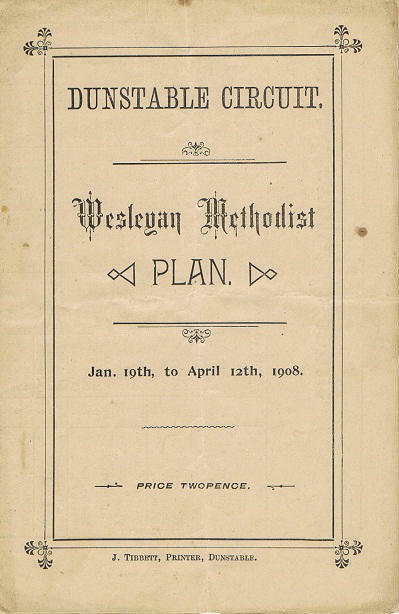 By 1853 the church supported a Wesleyan Day School that had one hundred pupils and also had a Library. 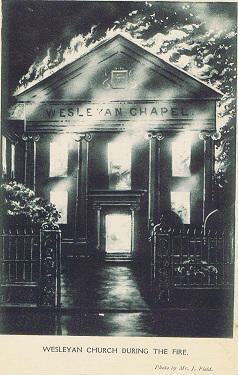 Disaster struck again in September 1908 when the second chapel was also burned down. How this fire started remains unknown but that summer there had been incendiary outbreaks in the area. Undeterred the Methodists pushed on with even more ambitious plans for a new church on a grand scale, with a spire that would be seen for miles around. 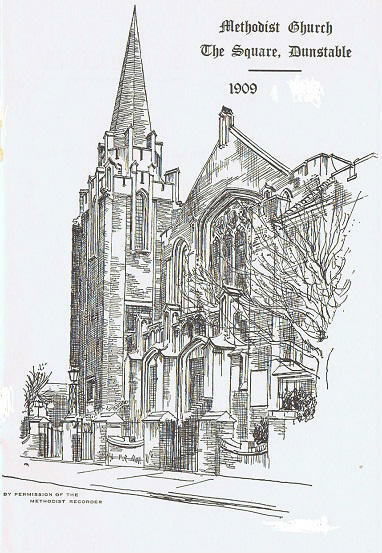 The present building opened in December 1909 with an overflowing congregation and Rev. Dr John Scott Lidgett preaching. A fine organ was installed in 1910 which is still in use today. The church offered support during both World Wars by opening a canteen to feed men and women who were serving in the forces. 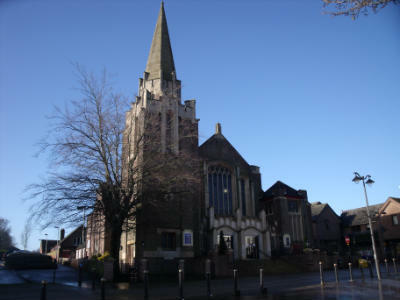 Throughout the remainder of the twentieth century and into the twenty first century the Square Methodist Church continued to evolve as a place of Christian witness and worship in the town. The church completed a building project in September 2009 which opened up the front of the church, improved access and the welcome area. Please have a look through some of the other pages on this website to see how the story continues. With thanks to friends at The Square for their help with material and pictures. Recently I was given a box of books to look through that were a record of many years of loyal and dedicated work at The Square. They charted the work of the Manse committee and the Church Working Guild; the events, catering and purchases. In 1956 the then minister’s wife, Mrs Brook, gathered together eighteen ladies with a view to forming the Manse committee. There followed coffee mornings, strawberry evenings, car rallies, Caledonian Markets, Harvest Suppers and Gather Rounds. In 1959 they started holding a Cup Final Coffee Morning on the first Saturday in May. That was before the M1 bypassed Dunstable and all the traffic came by the front door of the church. In May 1965 a Tudor Fayre lasted two days with all the helpers in costume. 1966 and the ladies catered for Synod feeding one hundred and fifty people on day one and four hundred on the second day. Tea was 1/6qt, Butter 1/10 - 1/2lb and sugar ½ per lb. In 1968 the President of the Methodist Conference visited The Square and another four hundred people were fed. They also assisted with catering at Conference in London that year. In 1969 The Square celebrated sixty years since the opening of the present church, with many special events. In Dunstable there were Manses to maintain in Great North Road and Friars Walk and the ladies shopped for furnishings to maintain the standards of the ministers’ homes. When the Circuit took over responsibility for the Manses, efforts were transferred to church premises and the name changed to the Church Working Guild. There was an old kitchen with scullery, stone sinks, range and a steam-belching copper to heat water. All this had to be changed and a new kitchen and modern water heater was “a great joy” to the ladies. And they didn’t stop there - going on to renovate and improve many parts of the church rooms and the church itself. In 1976 the Church Working Guild met for the last time at the home of their president, Mrs Barbara Gatehouse, and following a “delectable supper” finally closed their minute book “with just a trace of sadness”. With thanks to Maisie Bates and her daughter Jenny Smith for keeping and sharing the records containing so many memories. Taken from original notes written by Maisie Bates.